Home Model Trains	Awesome HO Scale Model Trains and Railroads at Train Show! 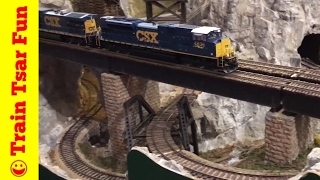 Awesome HO Scale Model Trains and Railroads at Train Show! Some really well detailed layouts. We really like the winding mine section of the one HO Scale layout. Also loved all the sound engines. We hope kids and adults all over the world kind enjoy our videos. While I do speak English, most videos have scenes of trains and toys without talking. So in any language you can enjoy toys and trains here.